Root privileges are not necessarily required to start the license server. olixtool, a command line tool to administrate the license server, i.e. to import license files. hw_explorer, a command line tool to determine the hardware identification of the license server (needed for us to create a license file dedicated to your license server). If you have installed JCMsuite you will find the license server tools also in the sub-folder license/olicense and hw_explorer in the bin-folder within your JCMsuite installation. (Replace path name separators ‘/’ by ‘' on windows). A hardware identification file will be created (hw_explorer informs you about its file name). Send the created hardware identification file (.jcm) to us via e-mail. After processing a license file (suffix .olixml)_ will be sent to you via e-mail. On Linux, the option -noAutoBoot suppresses an automatic creation of autoboot-scripts in /etc/init.d. Otherwise root privileges are required. Further options can be set by editing the script olicenseserver.ini placed in the same directory. For example you can set the -port=8080 to use the TCP/IP port 8080. The selected port must be open for all clients connecting the server. Make sure that the port is not blocked by your firewall! 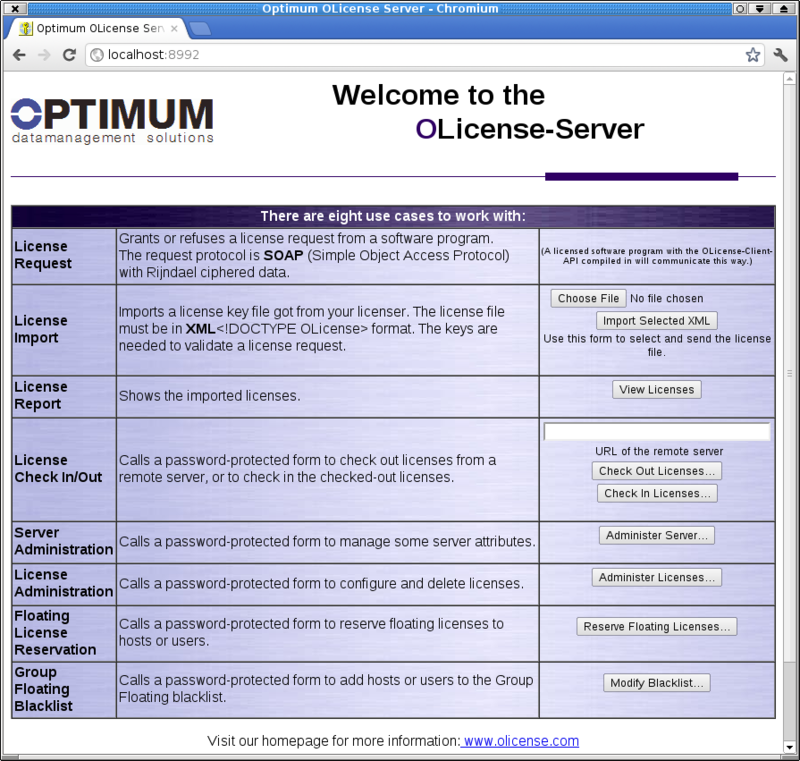 Comfortably, you can administrate the license server from any remote machine which can connect to the license server within your network either by your web-browser or with the command line tool olixtool. Also a user without an account on the license server machine is allowed to import license files. This web interface allows you to import license files dedicated to your license server, to configure the license server and to check the license status (e.g. who is using currently which license).